Hey now, stop shrieking. Put down the blowtorch! You do not need to take an ax to your computer screen. It’s *just* spiders. Feel free to take a few minutes to laugh at Superwoman’s skit about being scared of spiders, here. OK, now take some deep breaths people! How am I supposed to deprogram your girls from being terrified of spiders, if you are terrified of spiders? Really though you can be terrified, just keep it on the INSIDE. See? How do you go about deprogramming spider/bug fear from girls? Well it’s a process. It kind of stinks that fear of spiders/bugs gets so bad to begin with! But Halloween is coming so this is a great time to present some spider related activities to help your girls handle arachnids in their midst. One of my first steps when the girls were younger (Daisies, Brownies… but don’t let them kid you, Juniors love stories too!) was reading my girls some stories about spiders. AAAAGGGhhhhh Spiders, is a good one. 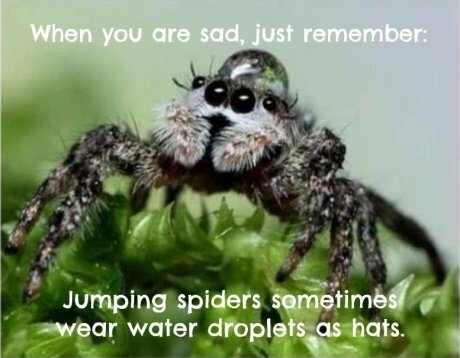 Also I’m trying to love spiders! On a side note, my girls (still) love it when we are camping if I bring stories to read to them at night. I was too tired this last time and we stayed up too late; but I had stories in my backpack ready to go. I compiled a list of spider facts for the girls which I felt would help support my “don’t be so scared of spiders” message. Yes, I essentially researched to affirm my own desired outcome. (Does this count as fake news?) There was a purpose to it though! Like from a page like this one with a whole bunch of spider facts, I pulled out “Most spiders are harmless to humans.” More fun facts to discuss with the girls? Spiders use their webs to catch bugs to eat, especially mosquitoes! The presence of spiders in your house is a sign that 2,000 fewer bugs per spider will be there every year. 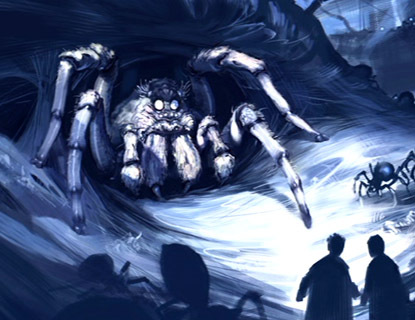 Spiders can’t see well and can’t see us until they are very close; and then we look like terrifying GIANTS to them! ~These three facts were pulled from this nifty link! I talk about spiders and bugs all the time during our meetings whether they are inside or outside. I try really hard to normalize the idea that just because we see a bug, we do not have to automatically kill it. I talk about how I take spiders outside (whenever I possibly can, sometimes it’s not possible). I constantly restate that to a spider we are terrifying giants! It does seem to help them get more comfortable with the idea of spiders and other bugs being around. I can’t close this post without sharing a(nother) funny spider story. Year ago (back in the dark ages), when I was only about 18 years old, I was a counselor at a camp I’d attended for many years. One day I was walking by a cabin of girls about 9 years old and I heard shrieks and screams and complete and total chaos and panic. So I went in to find out what on earth was going on. When I got inside, the girls told me there was a spider, and of course I, with my newly adult skills, was totally exasperated. Oh, a spider, is that all? We’ve got this. Yeah I always seem to say “Oh, it’s only a spider,” and then Mother Nature decides to bonk me on top of the head with the complete outer limits of what a spider can be. Oh, it’s just a spider! So yes, of course, this was a freaking giant monster of a spider and it was on a girls BED. On her comfy comforter. You couldn’t kill this thing on her bed. It would be like squashing a MOUSE on her bed. I mean, just, EW!!!!!! No! By this time I had one shoe off, and was trying to be the calm adult, and formulate a plan. I decided to knock the spider off the bed, onto the floor, where I would then SMASH IT with all due haste. (I was not yet in my be kind to spiders mode of thinking; though even if I had been I am not sure I’d have been able to get this thing to rehome it!) So I moved forward with my plan. Threw a shoe at the spider to knock it off the bed, and…. You know what happened next right? How a spider that big could hide, I do not even begin to know. By this time I’m hopping around on one foot scared to death that my shoe-less foot will land on the spider, and the ten 9 year old girls in the cabin with me are completely freaked out and shrieking and then my calm just completely broke way and I wound up just as freaked out and shrieky as the 9 year olds. Not even joking. Another counselor had to come rescue us! I am not sure we ever found that spider! So yes, in general I try to teach and demonstrate CALM around spiders (and other bugs), but even I have my moments. I hope you like crazy bug stories, I seem to have a lot of those!